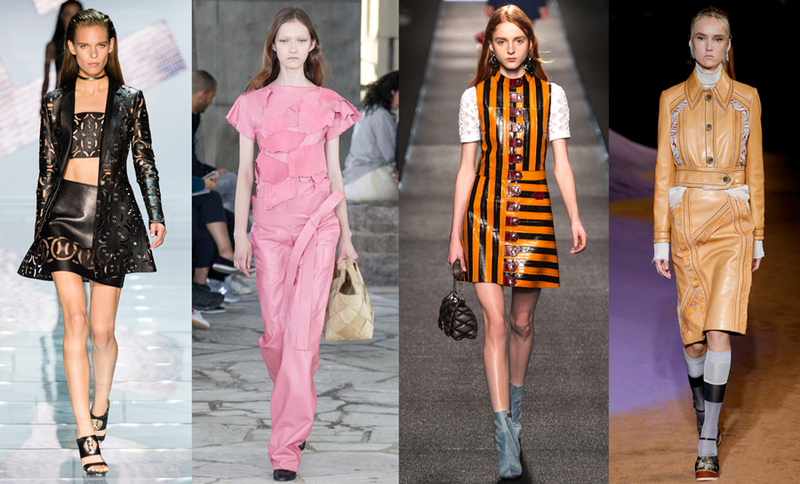 So as the spring/summer collections are starting to trickle into the stores I thought I would share my own little breakdown of the biggest trends this season, so you know what to shop. 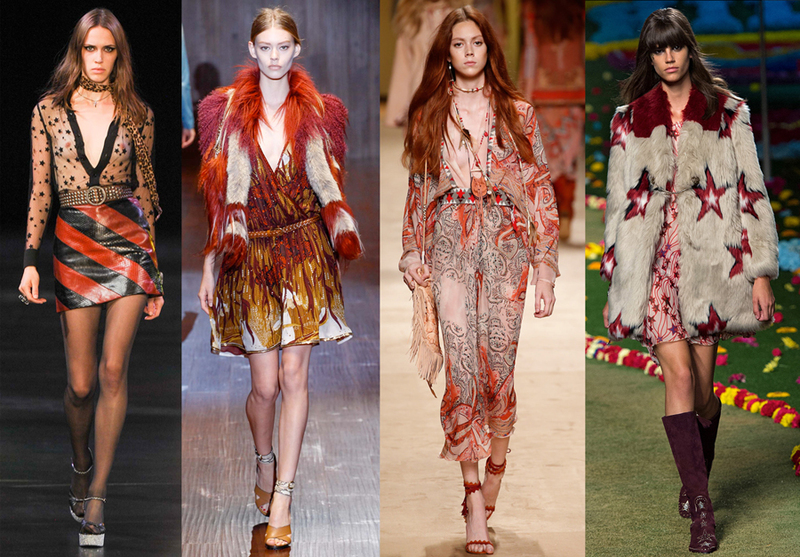 Probably the biggest trend of the season, the 70s revival bought a wave of coloured fur and bohemian cool to the catwalks. Think clashing prints, flowing dresses and wide leg jumpsuits or go glam with micro minis in leather and star print everything. 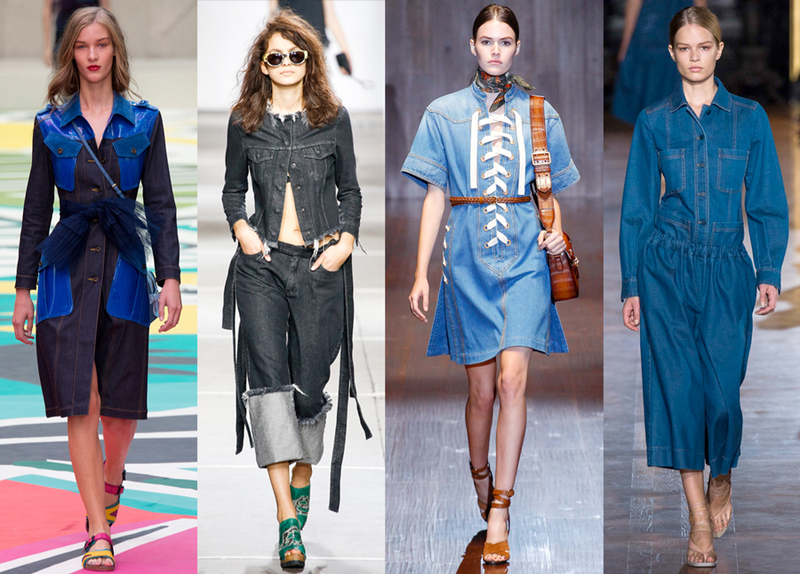 Denim was revived again this season. Whether it be coupled with utility details like at Stella McCartney or with an exaggerated take on classic tailoring as at Burberry, it’s a staple to keep. Military detailing was everywhere, particularly over-sized accordion pockets as seen at Marc Jacobs and Rodarte. 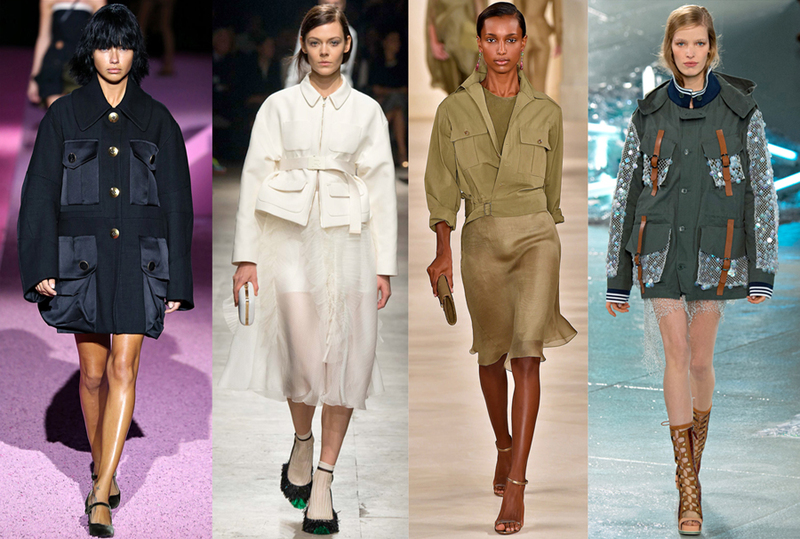 However this season the utility vibe was given a feminine twist, coupled with soft sheers at Rochas and Ralph Lauren. 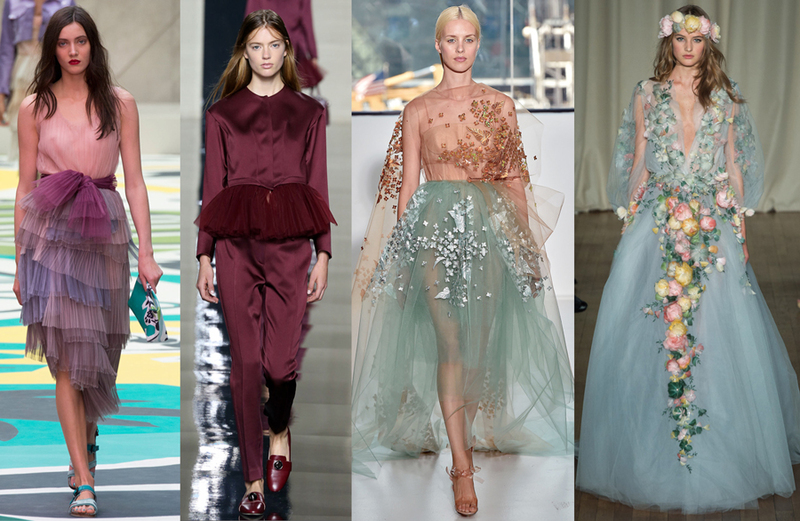 Tulle was another fabric that popped up many times this season, giving a fairytale feel to the SS collections. However if your not a girly girl (hello Marchesa) then opt for a flash of tulle in a sharp jacket a la Christopher Kane or just copy Burberry and tie a sash at the waist for an instant trend update. We live in a jet set world and so no longer does SS mean shorts and AW mean wools. This season leather (and suede) were key fabrics, from the lazer cut creations at Versace to the head to toe pink at Loewe, temperature is now irrelevant. This is by no means a new trend but it’s one that’s sticking. Geometric shapes ruled at Barbara Casasola and Simone Rocha opted for full sheer looks like the trench above. Marios Schwab and Tom Ford catered for the more confident lady with nothing but a little sparkle for modesty. The revival of the 70s brought back the power platform, in daring bright colours like the creations at Saint Laurent and fierce black, studded looks at Tom Ford. My personal favourite was Victoria Beckham’s velvet slingbacks with the flash of pink, divine. 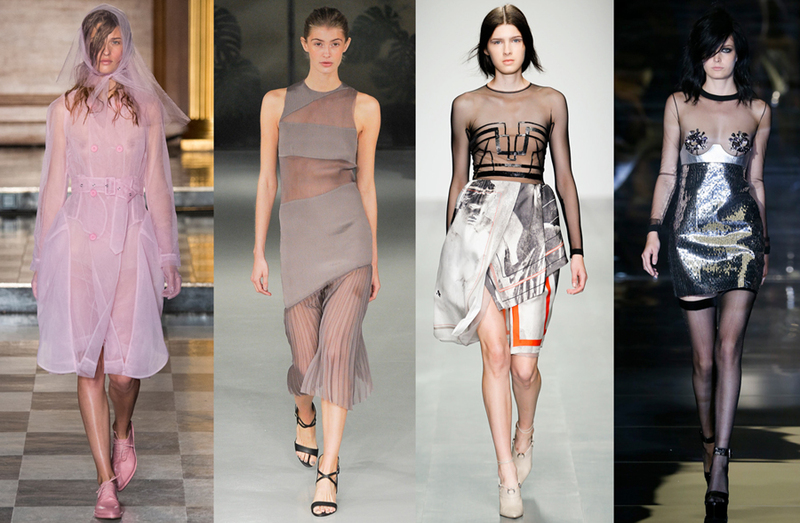 So glad to here tulle is in! Obsessed with that fabric haha. Thanks for sharing girl! Holiday Leathers = Oh yeah! Leather 24/7!